Quality Quest 2018, organised by the Quality Engineering team of Pearson Lanka was successfully concluded on 12 September at the BMICH. Themed ‘Inspiring Quality through Innovation’, this year’s event saw the participation of more than 250 Pearson Lanka employees, undergraduates and academia from the University of Sri Jayewardenepura, Sri Lanka Institute of Information Technology (SLIIT), University of Kelaniya, National Institute of Business Management (NIBM), Informatics Institute of Technology (IIT), University of Colombo, University of Moratuwa, University of Jaffna and the Rajarata University of Sri Lanka. Sanjeewa Senerath, Head of Quality Engineering welcomed the gathering and launched the Quality Quest Magazine. This is a publication featuring the latest developments in quality management practices, compiled by the Quality Engineering team of Pearson Lanka. Dennis Stetzel, Vice President Technology Operations and Global Business and Technology Services at Pearson stated that we at Pearson Lanka, has the responsibility of driving quality through our innovative solutions, which in turn impact millions of learners worldwide. Speaking at the event’s inauguration, was also Anura de Alwis, General Manager of Pearson Lanka who emphasised the importance of this event, which goes beyond Pearson to a national scale. He iterated that positioning innovation and quality as key drivers within the product development value chain, will provide Sri Lanka’s IT industry with a competitive edge. The keynote address was delivered by Rohan Jayaweera, Country General Manager for Palo Alto Networks. Rohan addressed the common misconception between invention and innovation, establishing that an invention is not an innovation unless it has commercial value. He further spoke about the importance of organisations fostering a culture that nurtures innovation and shared a multitude of examples from various industries as well as his own experiences as an employee of Google and as an entrepreneur. He concluded by saying that quality is subjective and that the reference point to quality can be redefined through experiences. Teresa Jacobs, Vice President, Global Quality Engineering at Pearson, spoke on the importance of shift left testing and how this approach will add value to drive efficiency throughout the engineering lifecycle. Further, she spoke on the changes that will happen within the quality engineering vertical, with technologies such as Virtual Reality, Cryptocurrency, Blockchain and Internet of Things (IoT) increasingly being a part of day to day experiences. Rohan and Teresa were joined by Malik Ahamadeen, Director/CEO of MAS Linea NXT and Subuki Shihabdeen, Head of Architecture and Applied R&D of Pearson Lanka for a panel discussion on Fostering Innovation and Quality. This session was moderated by Mahesh Wanigasooriya, Head of IT Business Management Office of Pearson Lanka. Speaking of the impact innovation has on the socio-economic growth of Sri Lanka, Malik emphasised the importance of breaking away from the island mentality, managing brain drain and consistent frameworks that are favourable to business. It was reinforced that Organisational leadership is a key contributor in inculcating an innovative culture. “It doesn’t get any better than our CEO John Fallon declaring a week-long initiative to drive innovation across Pearson,” said Subuki emphasising on the focus that Pearson leadership has on innovation. 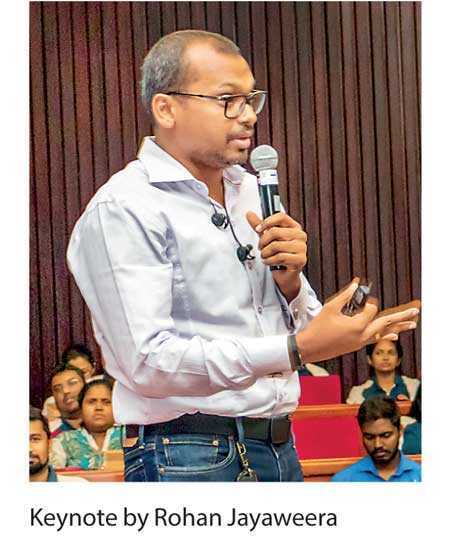 The event also included a presentation by Dr. Dushar Dayarathna, Senior Lecturer at the University of Sri Jayewardenepura who spoke about the importance of self-motivation. The proceedings of this event were complemented with an exceptional interactive and engaging musical performance by Pearson Lanka’s own band. This together with other activities such as poster competitions, article competition for university students, quiz competitions and technical workshops that led to Quality Quest 2018 are indeed testimony to the true spirit of Pearson.